If you’ve been keeping an eye on the payments or finance space, you probably know that the fintech industry is on the ascent. By providing services in specialized areas such as lending, investment management, bill payments, or money transfers, fintech companies have created a big impact in the finance sector. These fintech companies have successfully exploited inefficiencies in the traditional banking system by taking over services that were generally provided by larger banks to great effect. As fintech grows and this sector’s payment processing needs expand, it’s essential for both payment providers and fintech companies to understand why they might be considered a high-risk client. First, it’s helpful to understand precisely what fintech is, and why its unique business structure may make it high risk. Fintech is a portmanteau that refers to to the financial technologies services sector. Fintech started out largely at the back end of businesses, but has increasingly grown to include innovations that disrupt traditional financial institutions, including retail banking, investments, mobile payments, money transfers, and even cryptocurrencies like bitcoin. Before fintech, these services were fairly inefficient and ineffective in creating digital relationships with their customers. As fintech has become more prominent, these traditional service providers are realizing that these fintech companies can provide valuable services and customer insight. This realization has sent ripples throughout the industry, and helped finally merge ecommerce with financial services. However, with disruption (as with anything new) comes risk. Fintech as a sector is still relatively young, meaning that many fintech businesses are still in the early stages of the standard company growth curve. Fintech founders care about putting products onto the market, optimizing cash flow and turning conversions. They may not be thinking about how payment processors are viewing their businesses. Again, though fintech innovations have been a boon for consumers, the young age and entrepreneurship of this sector won’t necessarily count in its favor when it comes to payment processors. There are over 12,000 fintech startups worldwide. And while this might indicate that fintech is booming, it also means that these companies are all automatically considered a higher risk. Many startups don’t ultimately make it, so lots of payment processors will be wary of these companies and treat them with caution. Fintech companies are no exception. And due to the non-traditional structure and complexities unique to fintech companies, traditional merchant accounts might be nervous about taking them on. Some fintechs companies have business models that look risky to payment providers — consider pay-as-you-go auto insurance, for example. It’s perfect for infrequent drivers, but the potential for uneven cash flow might give payment processors cause for concern. Finally, there are a significant amount of fintech start-ups that deal with cryptocurrencies. These currencies, such as bitcoin, require technological infrastructure like blockchain (a shared, digitized ledger that cannot be changed once a transaction has been recorded and verified). While bitcoin is currently a hot topic with investors and the general public alike, payment processors are rightly a little cautious about this new currency. While bitcoin offers some perks (such as low transaction fees and high security), it’s also very unstable. In fact, 96% of economists surveyed by the Wall Street Journal believe that bitcoin’s popularity and value is driven by speculation, which isn’t a ringing endorsement of this currency’s long-term staying power. While some payment provider will provide accounts to fintech startups related to cryptocurrency, this sector is still considered a high risk. So what does this all mean? There are certain ways that companies can mitigate risk to a payment processor’s satisfaction, but there are certain characteristics of these companies that are immutable. There’s not much one can do about being a new startup, for example. That’s why fintech companies should consider specialized high risk merchant accounts for their payment processors. The benefits of working with a merchant account that understands the risks and challenges of a “high risk” business sector are numerous. These service providers have an understanding of non-traditional businesses, and certain degrees of flexibility when working with them. Many will even offer comprehensive risk management solutions or fraud prevention services tailored for businesses that are particularly at risk. Though many merchant accounts that specialize in high risk sectors will charge higher fees, some are lower than others. If personal credit history is good and the cash flow and sales are healthy, there are merchant account providers who should be willing to work with you to find lower fees. And a merchant account provider with favorable relationships with banks (both domestic and international) will also be able to find the best deal on rates for their customers. 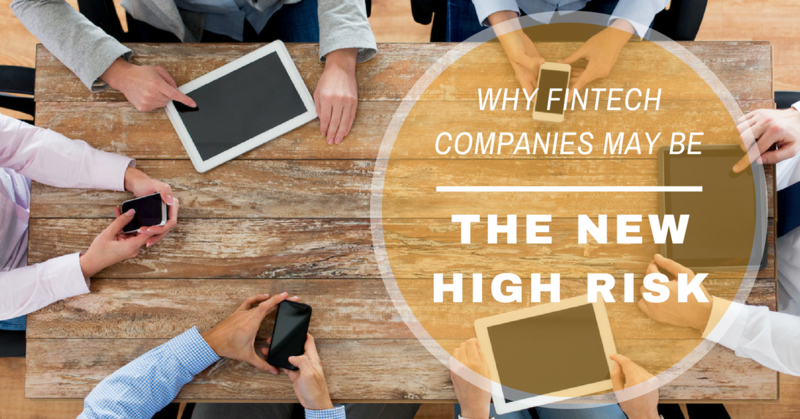 Fintech companies are becoming more widespread, and they might not be considered risky forever. However, thanks to the nature of the industry and the way payment processors calculate risk, high risk payment processors might be the way to go for these companies.